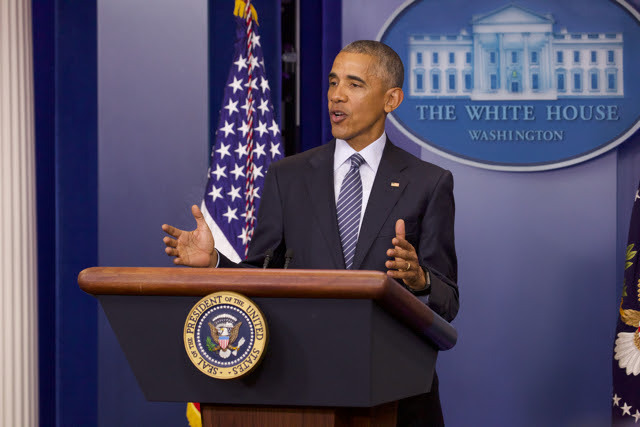 (TriceEdneyWire.com) - President Barack Obama, in his first press conference following the election of Donald Trump as president, declined to assess President-Elect Trump in the same manner as he did during the campaign. As protests continue around the country Obama has advised Trump to now reach out to racial minorities and women. After months of railing that Trump was “unfit to be president” Obama now indicates what’s most important is the peaceful transfer of power. Trump’s vitriolic manner of speaking and acting appeared to immediately change after the election. In his victory speech, he promised to be president for “all of America.” Despite the ugliness of the campaign between him and Secretary of State Hillary Clinton, he praised her for a hard-fought race; then said America owes her a “debt of gratitude” for many years of service to the country. In a White House meeting with President Obama last week – the first time the two had met in person – Trump called Obama a “very good man” and said he even looks forward to receiving counsel from him. Obama was not as flattering, but was clear that he intends to do everything possible to insure Trump’s success. He also expressed confidence that Trump intends to govern fairly despite his campaign antics that insulted women, Blacks, handicapped people, and veterans among others. But, Obama said he believes the Donald Trump that America saw on the campaign trail will not be the same Donald Trump in the White House. Some are not as convinced as Obama. The NAACP, the day after the election, reflected on Trump’s hateful words during the election and vowed to watch and hold Trump accountable. Trump has sent mixed messages in his initial appointments. On one hand, he has appointed Republican Chairman Reince Priebus as his chief of staff. On the other hand he has appointed Stephen Bannon, the head of the racist and White supremacist website, Breitbart, for nearly a decade. Bannon had run Trump’s campaign during the final months. At the end of the campaign, the racist campaign remarks had gotten so bad that even the official newspaper of the Ku Klux Klan endorsed Trump. Continuing in his conciliatory tone, Obama explained how he perceived Trump’s politics.